​With aluminum siding becoming a popular fixture in different homes, learning how to make them can be a potentially nice skill. The problem is that it is not as easy as most people might expect. It will take precision, hand skills, and attention to detail to get this done right. 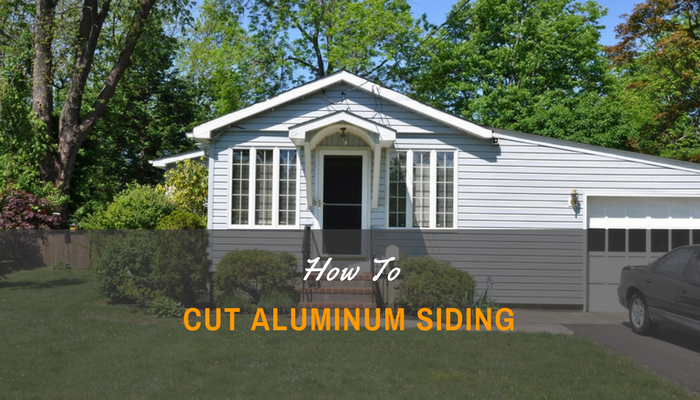 Here is the process of how to cut aluminum siding. Why Aluminum Sidings are Popular? Aluminum as a siding material is quite popular because of its superior aesthetics. Provided you use high-quality aluminum, it will look good in just about every kind of home, regardless of design or theme. When used as a component for renovation, it can radically transform the look of your property. Aluminum sidings are most popularly used in window and door frames, while it can conceivably be used anywhere in the house. They are most commonly found in houses that use a lot of aluminum, which helps in achieving both an aesthetic and functional look. Your inner handyman desires to construct most (if not all) of your house using your bare hands. Many people, especially those who think that they have a lot of DIY experience under their belts, believe they can do the cutting themselves. However, there are some problems that should be dealt with. The biggest issue is how challenging cutting aluminum can be. You need to make sure that all measurements are on-point before you can even make the first cut. As for the process of cutting through the metal itself, it can be described as something that requires your full attention. Learning how to cut aluminum siding is not going to be easy. You would need a bunch of tools (see more) and an exacting approach is needed. However, you don’t really need to have expert level skills to complete this job yourself. The following is a simplified guide on how to cut aluminum siding. Before you even think of putting a new siding in place, it is crucial that you clear out the area where it’s going to be installed. Remove the old siding. The technique here depends on the type of old siding you have, but you can get the help of a professional if this proves to be too complicated for you. After removing the old siding, you must prepare the area where you’ll be installing the new siding. Clean the surrounding wall as any excess dirt can cause the underlayment and sealant to not bond properly. Any excess paint or putty should also be removed. Any protruding item such as nails should be removed or flattened. Any dent or hole should be filled with putty or sealant. After cleaning up and fixing the bare wall, you can then install your choice of underlayment material. The most common underlayment used with aluminum is foam board, though you are free to use other materials if you see it fit. Underlayment should be installed properly to prevent the formation of gaps. Install the corner posts and footer. These are pieces of trim that will serve as part of the framework of not just the siding, but also of the borders of the door or window. Take note of the measurements of the corner posts and footer, as it is essential for the proper placement of sidings. Apply sealant at the corners to ensure an airtight seal. Because of the inherent brittleness of aluminum, it is a risky approach to just haphazardly cut up the sidings. It is important that you make the proper measurements first before you start cutting. Measure the dimensions of the area where you will be installing the ﻿siding﻿s. Ideally, the siding should fit flush into the edges of the door/window frame. These measurements would then serve as your basis for cutting into the sheets. Using these measurements as a guide, draw up lines in the aluminum based on the measurements as your guide for cutting. Using the guide lines that you drew using the pencil or chalk, cut the sidings according to your measurements. For cutting large pieces of siding, you can use a power saw. The most recommended blade for the job is the panel blade because it cuts through aluminum without tearing or snagging. For making smaller cuts where using a saw would be too cumbersome (ex. : when cutting at the edges), cutting using tin snips is a better option. This provides you with better control in making small cuts, ensuring uniform cutting with no damage on the aluminum. ​Once you have completed the cutting, the next step is to install the sidings in their respective places. Before going for the installation, make sure that each piece fits exactly where they should be. Otherwise, you will have to go back to step 3 to ensure that you arrive to the necessary dimensions. Once all dimensions are deemed to be correct, it is time to install the sidings. When installing sidings on windows or floors, it is best to start at the floor to minimize the potential of leaks. After installing the floor sidings, you can install the sidings on the opposite corners, and then install the sidings on the top. Secure in place by attaching nails into the nail strips found at the sidings. You don’t have to place the nails too deep as the sidings are intended to hang in the nails rather than be nailed on place. Finish all sides of your project one by one. When it is necessary to use more than one siding to complete one row, overlap each successive panel by 1 inch. Once installation is completed, add sealant at the corners and gaps to ensure an airtight fit. That is the procedure on how to cut aluminum siding. Follow these simple steps and you should be finished in no time.